It is an intelligent form of exercise, invented 70 years ago by Joseph H Pilates. (1880-1967) He called the method The Art of Contrology, which refers to the way the method encourages the use of the mind to control the muscles. Its focus is on strengthening the “powerhouse or “core” (abdominals, back and buttocks) to execute the exercises. The outcome of Pilates training is a balanced body which is strong and supple, creating a flatter stomach, balanced legs, a strong back and improved posture, without adding bulk. The method involves concentration and the coordination of breath and movement, thereby helping to balance the mind and body, which in return helps to relieve stress and anxiety. Pilates is recommended by those in the chiropractic and physiotherapy profession for strengthening the core muscles which support the spine. After regularly practicing Pilates one can expect increased mobility in the joints, a flatter stomach, a thinner and stronger waist, back, thighs and improved circulation. Regain the ability to move easily and without pain. Pilates is the antidote to the modern day stresses and strains of sitting in cars and at work stations etc. slumping, hunching and ruining our postures. If the tracking is out on your car, you get it fixed to avoid wear and tear of the tyres. If you posture is out, what do you do? Pilates is an ideal exercise for those needing rehabilitation exercise through physical therapy (one to one sessions recommended). Arthritis sufferers can also benefit from Pilates as it helps to reduce stiffness in muscles, and also assists in the prevention of osteoporosis. Co-ordination, both muscular and mental are key components in an effective Pilates programme. As well as the improvement of posture, balance, core strength, back strength, bone density and joint health, many experience positive body awareness for the first time. Pilates teaches balance and control of the body and that capacity spills over into other areas of ones life. Joseph Pilates developed the “mat work” series which is taught at different levels depending upon ability, only moving up through these levels, when breathing and complete control of each exercise, has been mastered, safely and efficiently. Pilates also invented exercise equipment, which are sprung tension machines; these include the reformer, Cadillac, wunda chair & foot corrector. Because of the remarkable nature of the equipment to both challenge and support the body as it learns to move more efficiently, these machines act as a compliment to the challenging “matwork” series. 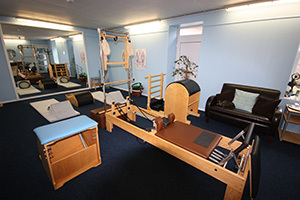 As it is difficult to transport the machines from class to class, the use of flexi-bands, magic ring and small ball can be used to simulate the exercises performed upon the Pilates equipment. Pilates is an intelligent form of exercise that strengthens, lengthens and tones muscles, improves posture and balance, provides flexibility, coordination, and unites body and mind. Pilates is suitable for all age groups and fitness levels. Pilates is excellent for injury prevention, as well as rehabilitation after injury or operation. One move done correctly in Pilates can be more effective than many repetitions done badly in the gym. Pilates is performed regularly by Olympic Athletes and sports people to complement their training and for injury prevention. You will feel the difference after your first session and see the difference after five sessions - Thats right - Five weekly sessions will make a noticeable difference to the way you both feel and look.